Strange. I don't think there's one thing I saw in the film that didn't remind of another movie yet I don't think I've seen anything like "Minuscule 2: Mandibles From Far Away" in recent years. Not even "Minuscule". It's not the 'animated movie of the year', and yet it provides a constant feeling of relaxed satisfaction despite my frustration for not having seen the original. I missed it for two reasons: it wasn't from any major animated studios and didn't get any awards buzz and I wasn't yet a father. 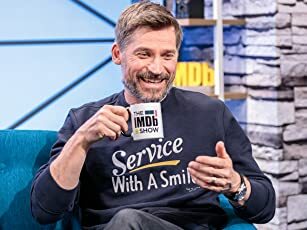 Indeed, this is one of these instances where having a child can be beneficial in the way it makes you venture in the kind of movies you wouldn't even have dared to watch. And what I got was something with some hypnotic backgrounds of a National Geographic documentary and an old-school cartoonish inventiveness, not to mention the heart and thrills that have nothing to envy from any Disney or Miyazaki productions. So the film started and I think I was misled by the opening shot, it looked so real I was afraid I went in the wrong room. Then the majestic panoramic shot of the mountain followed by the forest ended with a ladybug that couldn't have been more cartoonish-looking, two eyes, two rounds and the rest is all schematic simplicity. The design is so rudimentary it looks incongruous in the middle of such realistic magnificence. I was reminded me of an early 90s cartoon paying tribute to La Fontaine's fables, it was one of these first 3D cartoon and the title was "The Geometric Fables of La Fontaine". And like in that cartoon, there was no dialogue, only a narrator. 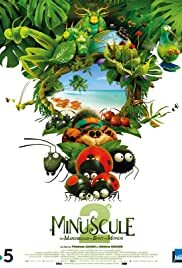 In "Minuscule 2", I realized the communication would be all buzzing, and I noticed many kids laughing during the first humming sounds, it was like they reminded them of farting or raspberry sounds. Personally, I was annoyed, I couldn't imagine enduring one hour and half without any intelligible dialogue. But two minutes after, the lack of words sounded as natural as if it was dialogue. And I'm glad that the human part were kept without dialogue or with speeches sounding like gibberish, à la Chaplin's "City Lights", like a silent film. 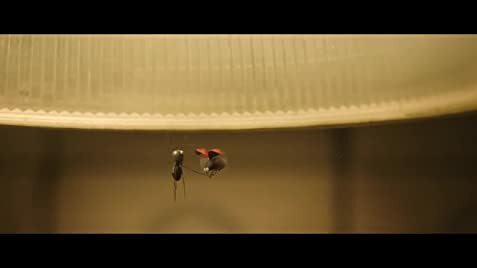 So there's a friendship between a ladybug and a black ant, so it seems. I guess this is what I missed from the first film. But I just love the way the insects are portrayed with a fauna and flora of their own with and each species with its rules of behavior and communication devices. And then nothing prepares us for the fantastic trip to the Guadeloupian islands. I wouldn't spoil that because the set-up is one of the creative highlights of the film, which is saying a lot. But take word "creative" in its loose meaning: many parents and even children will see a connection with "A Bug's Life" for the animals and the setting, "Wall-E", especially the first part for the silent dialogue or for the cockroach cameo and "Up" or Miyazaki for an unforgettable flying device (the spider looking uncannily like one of Miyazaki's black soot sprites). So the film while not a masterpiece is a fun piece of animated in its own right, not in the plot, not in the setting, but in the way it manages to be a pleasing experience for a children and their accompanying parents I saw the film with my daughter, she is five and she just loved it. She smiled at the buzzing sounds, had a jump scare with the spider, asked me if the poisonous caterpillar really existed and she enjoyed the film. There's nothing too sophisticated about it or too fancy but it manages to hit a sensitive chord to both adults and kids. I don't know if it has the pretension to be anything more than a sweet and simple little film but within that modest ambition, it succeed admirably. In fact, it succeeds so much I would highly recommend it, it seems like the perfect movie for kids between 4 or 10. Beyond that age, they might be a bit too blasé about animated films but it would be worth giving it a try, it's not even too long to be felt like a waste of time. So speaking for myself and my daughter, "Minuscule 2" will not be a waste of your time.